Will Thailand Top Nepal as Site of World’s Biggest Passover Seder? In Koh Samui, Thailand, the total number of Seder participants this year could exceed 2,800 under six separate tents. Nepal’s world-famous Passover Seder, held annually high in the Himalayas in the capital city of Kathmandu, reaching a peak of some 2,000 guests last year on its 30th anniversary, stands as a perpetual icon of Chabad-Lubavitch’s “no mountain too tall to climb” approach to Jewish education and outreach. Well, a few countries to the southeast and a sea away in Thailand on the island of Koh Samui, the annual mega-affair in Kathmandu, commonly dubbed “The World’s Largest Seder,” now has company—lots of company. 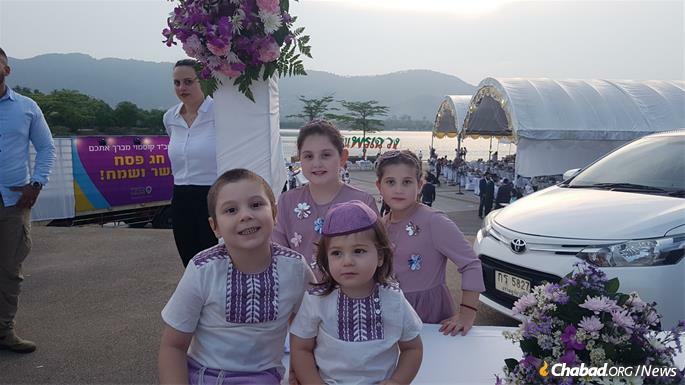 Despite it being so close to Passover, Chabad.org caught up with the busy organizer of a Seder planned for the exotic island getaway, Koh Samui, that is threatening to outstrip Kathmandu’s numbers by as many as 1,000 guests this year. 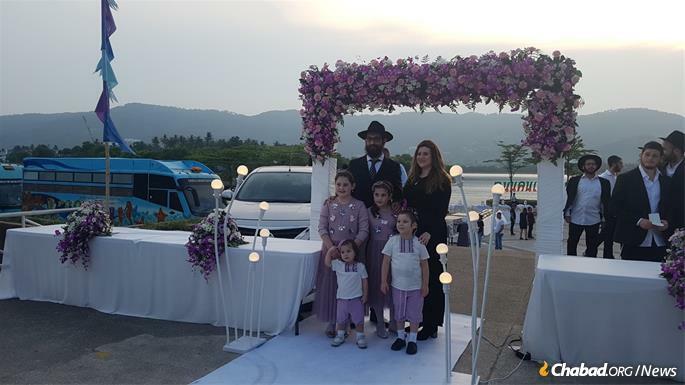 “Yes in fact we are looking forward with much excitement to yet another great experience with even more people this year,” said Rabbi Mendel Goldshmid, who co-directs the Koh Samui Chabad-Lubavitch organization and its Seders with his wife, Sara. Last year, one of his three Seders—three of 14 total held in the tropical Southeast Asian nation—was already in the 2,500-guest range. Still, in the end, all agree that when it comes to the numbers, who’s really counting? Chabad’s Asian Seder sprawl—from Nepal to Thailand to Cambodia to China—and elsewhere in the world is being produced by one big happy family with a common vision. Whether in Kathmandu, Bangkok or the other countless places internationally where sizeable public Seders are produced by the movement’s emissaries, the goal is the same: “Increasing Jewish participation, education and unity,” said Rabbi Yosef Chaim Kantor, Thailand’s chief rabbi and the country’s head Chabad-Lubavitch emissary, who himself holds a large community Seder for English speakers in Bangkok. 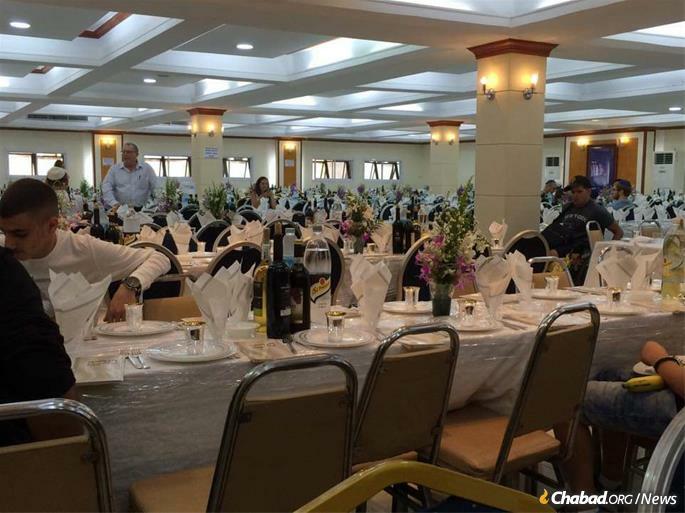 Rabbi Chaim Eliezer Ashkenazi, administrator and logistics chief of Chabad of Thailand, who runs the Bangkok community Hebrew Seder, said sizeable numbers add to the unity, but also add to the “awe and splendor” of the annual celebrations. Rabbi Mendel and Sara Goldshmid and family welcome guests to last year's Seder. Members of the Wiener family—Brian, wife Lauren and adult children, Aviya and Asher—made the more than nine-hour flight from Melbourne to attend one of the Koh Samui Seders—not once but twice in the last 14 years, including last year. Preparing for one of a number of large communal Seders in Bangkok, Thailand. 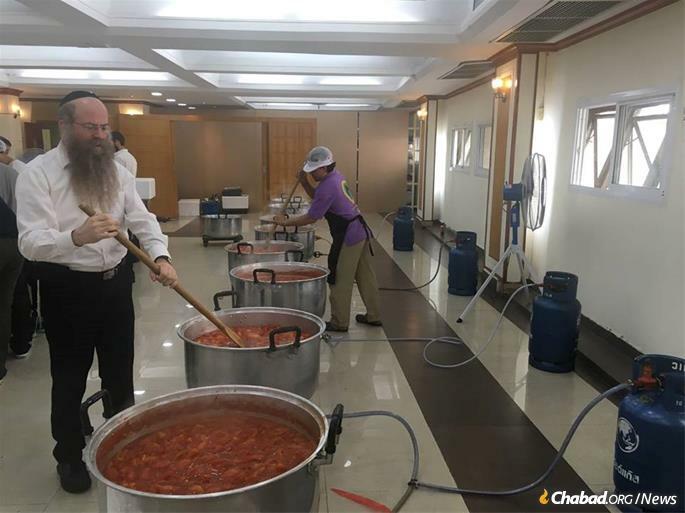 After two decades holding Seders that are also part of the growing array of Thailand’s communal gatherings, Rabbi Nechemya Wilhelm, who has directed Bangkok’s Chabad traveler’s center for the past 24 years with his wife, Nechami, remains awed by the experience. Wilhelm, Goldschmid and their wives are not foreigners to serving large numbers, as both organizations annually field a total of some 150,000 visitors, providing material and spiritual nourishment to an average of 300 to 500 Shabbat guests per week. Patrons of their services are mostly tourists and business travelers, as the local community of Jews is only a few thousand-strong in Bangkok and between 100 to 200 on Koh Samui. Outside of Bangkok, in addition to Koh Samui, large public Seders are planned this year for Chiang Mai, Phuket, in neighboring Laos under Thailand’s direction, and Pai, a Thai city being added this year for the first time. At the largest of Thailand’s Seders last year—where the crowd of some 2,500 showed up in the facility on Koh Samui—the guests were seated in five lavishly lit separate overhangs, allowing Nepal and its Chabad-Lubavitch co-directors, Rabbi Chezki and Chani Lifshitz, to yet lay claim to having the largest Seder in the world under one connectedroof. 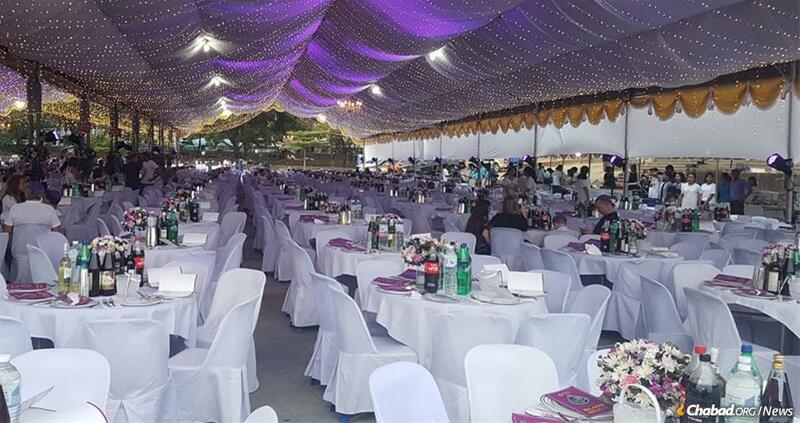 This year, on Koh Samui, where the total could reach or exceed 2,800, holiday celebrants will be seated in the same arrangement, with an added overhang for a total of six sections and divided by language, described Goldschmid. All told, Thailand is expecting more than 6,000 total guests spread over what will be a total of 22 Seders this year. 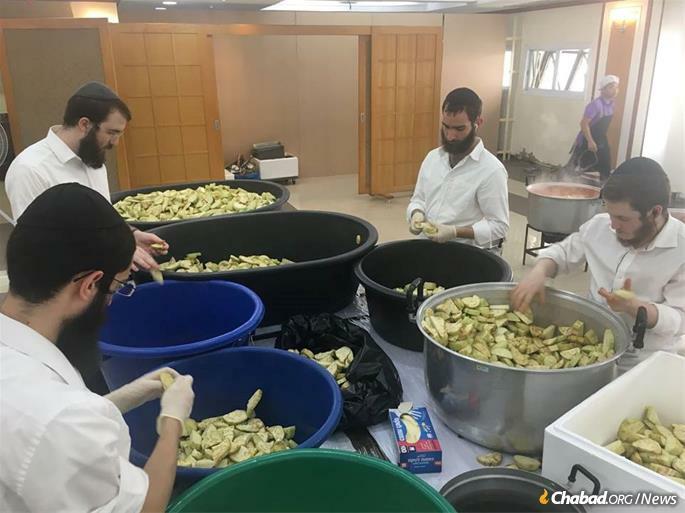 Rabbinical students from around the world will be traveling to Thailand to help out before, during and after the Seders. The Seders in Thailand, in contrast to Kathmandu’s, which historically have drawn more of a rough-and-tumble backpacking and soul-seeking crowd, serve a clientele of more local community members, businesspeople and other travelers from around the world, including many from Israel, with a regular contingent of young Jewish soldiers having just finished their national service. Coming off another sleepless night while running from city to Thai city as distant from one another as an hour by plane, the man who handles many of the nitty-gritty details for Thailand’s Seders under Ashkenazi, Rabbi Yossi Goldberg, shared that he expects the numbers of participants and corresponding food supplies, staffing and other amenities to increase by 20 percent this year. The amount of foodstuffs alone is staggering. 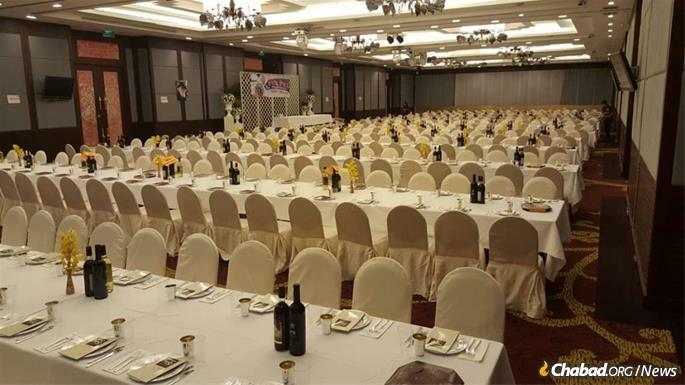 To accommodate the number of projected guests Thailand-wide, an estimated 7,416 portions of chicken, 7,362 portions of beef, 7,353 portions of salmon, 2,220 bottles of wine, 3,210 kilograms of matzah and 4,056 kilograms of salad varieties will be served by 415 waiters, said Goldberg. Thailand’s Seder-goers will be watched over by 150 security personnel and assisted by 41 rabbinic students and four couples being flown in as Thailand’s portion of the army of helpers Merkos L’Inyonei Chinuch—the educational arm of Chabad—sends annually to assist at Seders worldwide. Ten Chabad-Lubavitch emissaries from Thailand who serve in their capacities under Kantor will lead the proceedings in the various locations. Kantor, having built Jewish presence and programming in the region virtually from scratch with the help of his wife, Nechama Dina, beginning in 1993, takes on much of the fundraising for the Seders for beyond what the modest admissions fees cover. Preparation stages for the Seders are also massive, involving a fleet of forklifts, warehousing, high-tech food production in commercial kitchen equipment, trucking schedules, tent construction, electrical work and the exhaustive planning and coordination that goes along with such massive supplies and people. Setting up for the Passover Seder in Chiang Mai, Thailand. Meanwhile, over in Kathmandu, which will hold its 31st Seder this year since starting up in 1988, the Lifshiftzes are not resting on their laurels. The couple, who took charge of the high-profile affair in 2000 when they started as the city’s Chabad-Lubavitch emissaries, are busy planning what will always be known as host city to the first “World’s Largest Seder.” More than 1,500 pounds of matzah and 1,000 bottles of wine were required to accommodate last year’s crowd and this year promises to be bigger. With the help of their own flank of traveling rabbis and rabbinic students, the Lifshitzes also have a tradition of multiple Seders—at least two, in addition to Kathmandu—across Nepal. One of those rabbinical student assistants, Shmuel Loebenstein, traveled to Nepal from New York in 2012 to help with the Seder in Pokhara, a gateway to one of the popular Himalayan hiking trails in central Nepal. That year, supplies for all of the Seders coming from Israel were exceedingly late, setting preparations on an uneasy keel for everyone involved. Throngs of Israeli Jews cheered the eventual arrival of the Passover supplies when they moved through the entrance gates with only about a week to go before the holiday. Rabbi Nechemya Wilhelm, who has directed Bangkok’s Chabad traveler’s center for the past 24 years with his wife, Nechami, remains awed by the communal Seder experience. Nepal’s Seders not only broke ground for the practice of holding large Seders in remote places, but historically would set the tone for a new brand of outreach and Jewish education in the region and elsewhere. They ultimately would lead to the establishment of dozens of new permanent Chabad centers, from Thailand to South America to Australia and beyond—focused on the material and spiritual needs of backpackers, and other tourists and business people visiting places far away from home. The stories of lives changed and needs served are countless, as in the experience of Wiener, the traveling diamond-dealer. But one is especially pertinent to the upcoming festival. It’s about a woman whose experience is reminiscent of those tales about Jews seeking spiritual enlightenment outside of their tradition. As many of those stories go, the sought after spiritual guides would often tell the seeker to look for the elevation inside Judaism. Such was the case in general terms with Irit Goren of Tel Aviv, a participant at one of the early Seders in Kathmandu who had come to Nepal to study Eastern religions. The Goldshmid children get ready to ask "The Four Questions" in front of thousands of Seder guests. I am truly lost for words how amazing this Passover Sedar shall be. Rabbi Nechemya Wilhelm ad his wonderful wife are so giving in my reading this wonderful artice. They are truly great Jews of the tribe. I wish I could attend and see this most blessed event. Seeing pictures of rabbical students cook and prefer the feast is so heartfelt. I would truly enjoy as always, the matzah that I can consume at any time.